Word .DOC Format. Artist Producer Development Agreement from the Artist's Point of View. This contract is for an independent producer to create several master recordings and land a record deal with a major label within a one (1) year time frame. The deal becomes null and void if the masters are not completed and/or a major label deal is not procured within the term. View the sample PDF file by clicking the 'Download' tab on the product's detail page. 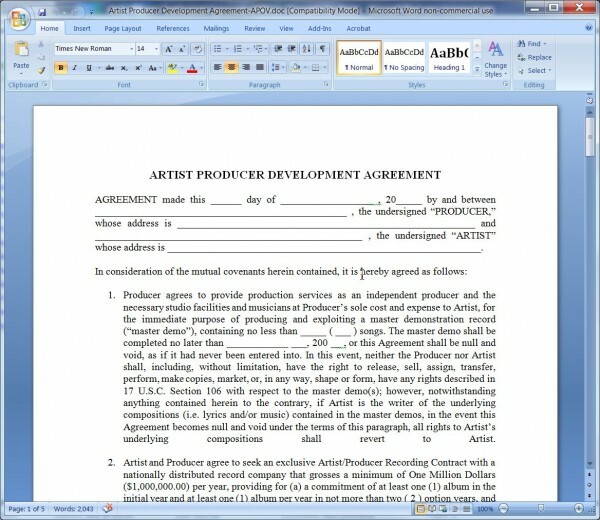 Artist Producer Development Contract from the Artist's Point of View Sample in PDF Format.